I don't know really - non toxic for humans might not be the same as non toxic for hamsters. I did find a good one - it was recommended on a German forum. It wasn't cheap but it's great stuff and a big bottle, easy to use, glues wood really well and doesn't smell of anything - I've used it for all sorts over the last year. I used it to glue legs onto wood houses and they set hard. Funny I came across ponal and it looked good but yes quite expensive but I suppose it would come in handy for other jobs as well and would last for quite a while. I nearly didn't get it because of the cost. I think I actually ordered it cheaper from Amazon Germany in the end - even with the postage it worked out a lot cheaper. I think there is a 250g bottle as well. Yes I've used it for all sorts It looks a bit like copydex - sort of white - no smell really and has a good nozzle on the end of the bottle for getting a small line of it out. It works out at £11.96 with postage if ordered from Amazon.de and takes about a week to arrive. The smaller bottle doesn't seem to be available to send to the Uk. I use Ponal too, I think it's Ponal express, the quick drying one, that I have & I was a bit doubtful due to the price as well but it's really good, I've used it a lot but still have plenty left so it will last a long time & I don't regret being a bit extravagant, when am I not with ham things lol! Mine is just the classic and it sets rock solid! Although I do leave it to set for a good few hours so maybe not as quick drying as Cypher's. Yes it is a lot of money for glue - but it's good stuff and ham-safe Shame we can't all share a bottle. Haha yes serendipity now that would be a good idea! I guess 12 isn't too bad really when you think of it. I am trying to pick a non toxic glue for making Mushu's ew platforms and attaching ramps to them (I plan to make both out of wood, painted with plastikote). I see Ponal is popular and Amity has recommended Elmers. Which would you say is better? Also, will glue stick to the plastikote? Or, should I glue the wood first and then paint the plastikote on after? Thanks Serendipity. 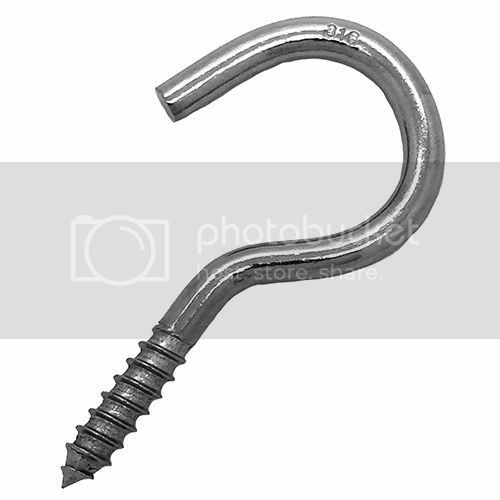 I was actually going to use it to attach ramps to a platform, but now I am leaning towards a metal attachment (as suggested by Hamsterita) like this, where the screw goes into the ramp and the hook into the platform. Will bear the glue facts in mind should I need them, though!